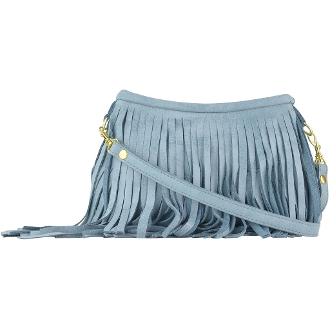 Two layers of fun JJ fringe make up this adorable suede mini crossbody bag. Detachable 49” strap allows you to attach your flip flops and other festival essentials. 8 inches X 6 inches Double Fringe layers on outside of bag create a total length of 9 ½ inches. You can special order any of our jj winters bags in any color of suede or leather. Please allow approx 3 weeks.